Yesterday, I spent the morning at Steve McKenzie's, a home decor shop on the westside of Atlanta. 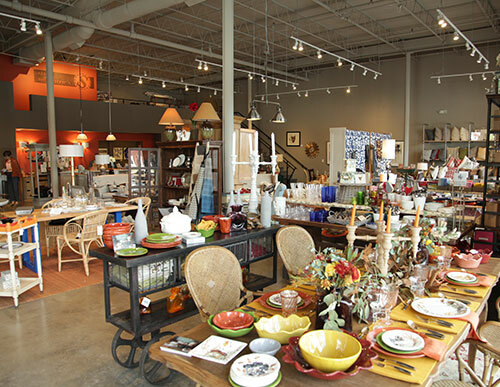 Owners Steve and Jill McKenzie carry an eclectic and inviting mix of French, mid century modern and southern home decor. They love a mix of styles and textures or as Steve shared, "We only bring in what we believe in." The space is one large, cozy room and a mix of furniture, textiles, tabletop, stationery and small goods. I personally liked to see all the Southern artists in the shop, including R. Wood Studio, ColsenKeane, Thimblepress and Rifle Paper Co.
What's nice is every month, Jill and Steve pick a new Southern artist to showcase their artwork, which is then displayed throughout the space. This month, it's Decatur, Georgia based artist, Ruth Franklin. There are currently over a dozen of her acrylics on canvas and charcoal drawings in the shop to stop and take in- so stunning. Steve was a painter for 30 years and still dabbles today, as his entire fabric collection (about 44 different prints now sold throughout the US and Canada) are first all hand painted by him before reproduction. Steve is also an interior designer and lends his expertise for residential design, which has become a major aspect of the business. Steve McKenzie's is the largest stocking dealer in the US of Blenko glass and in this space, you'll find all you need for your tabletop. If you or someone you're buying for loves to entertain, this lovely and delightful shop is a fun spot to peruse. And if you're not able to visit in person, no worries, just check out the shop online, here.